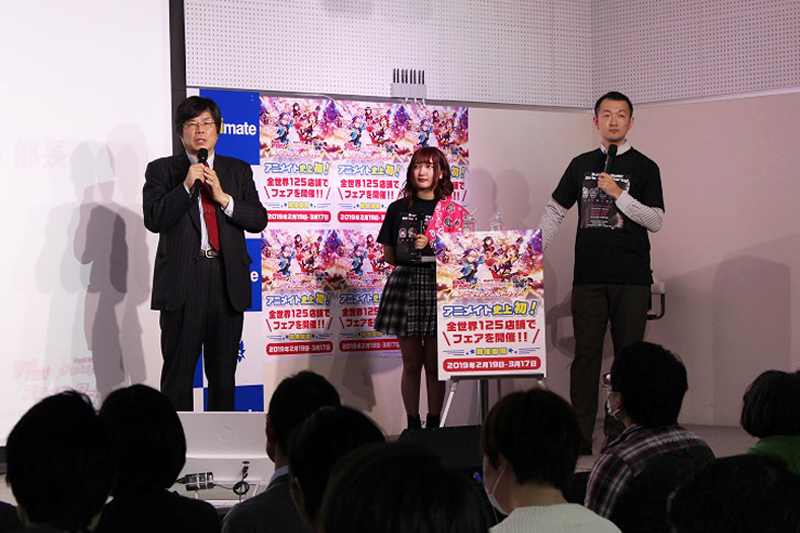 PRESS CONFERENCE: For the first time in Animate history, the “BanG Dream! 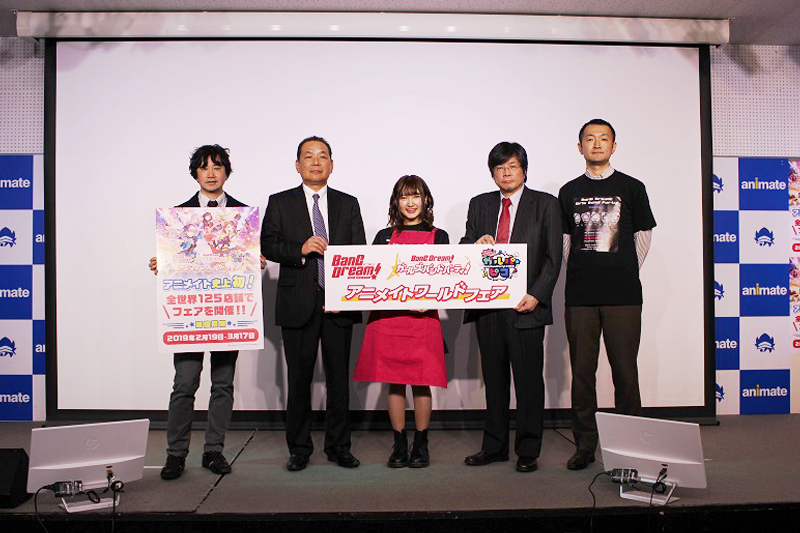 Anime World Fair” will be held at their 125 shops worldwide! 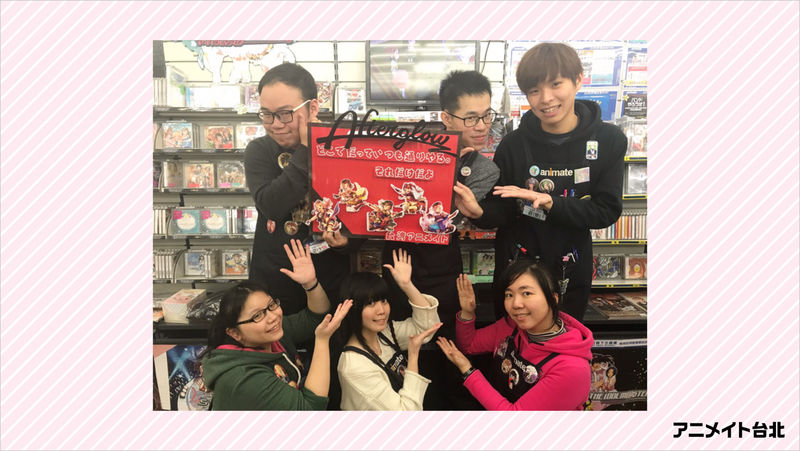 Animate Ltd. operates many Animate shops, specializing in authentic licensed CDs, DVDs, Blu-ray Discs, character goods and other merchandise relating to anime, manga and games. 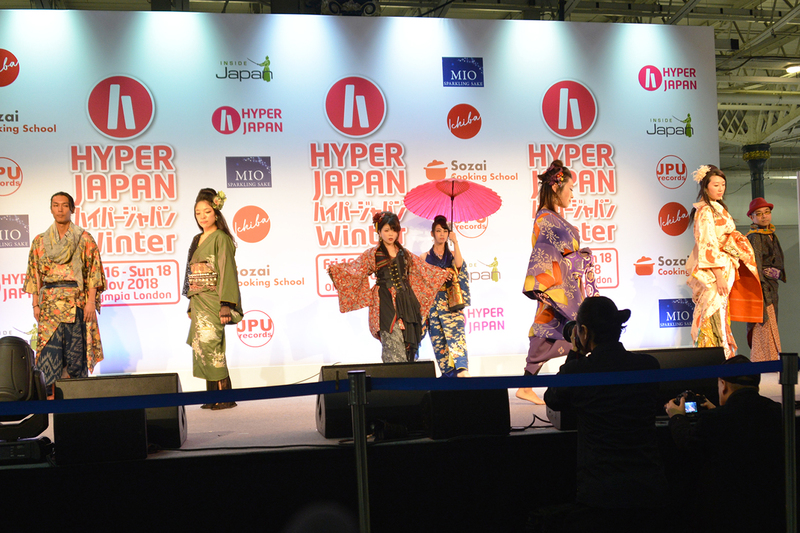 They have just announced they will hold a world fair at their 125 shops across the world for the first time in their history, starting on February 19, 2019. 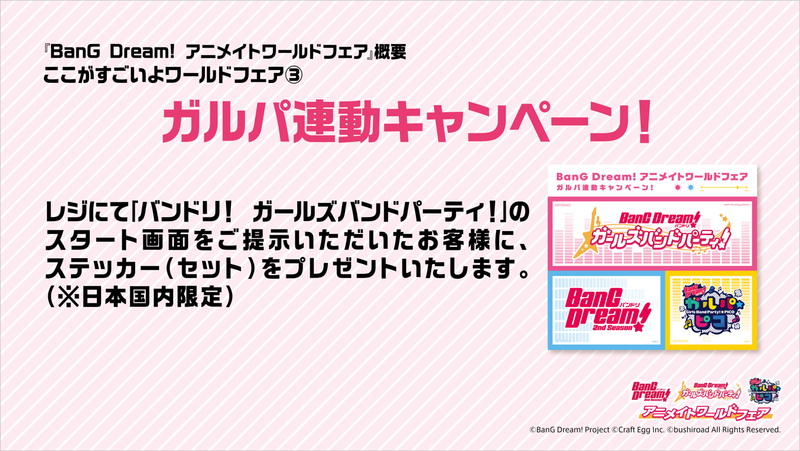 The fair features the “BanG Dream!” project. 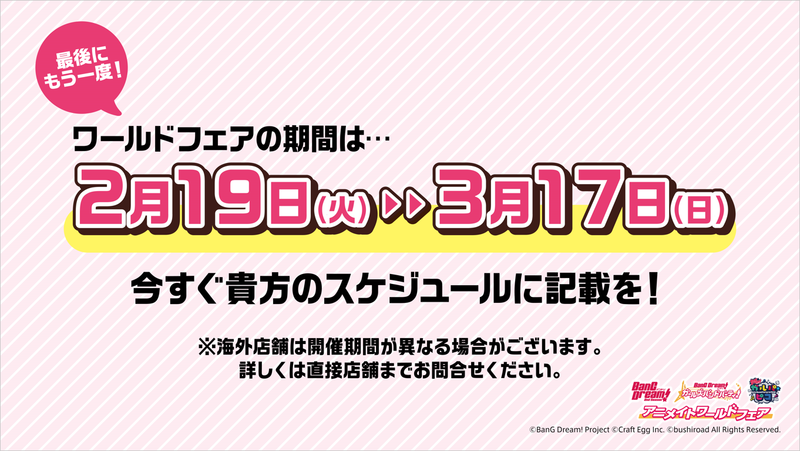 This project is spread across different media: First of all, a manga with the same name was published serially in Monthly Bushiroad magazines. Following that was the anime, game, comic books and the simultaneous live stream by voice actors and actresses. The voice actresses formed bands as the “Next Generation of Girl Band Projects” where anime characters are linked with live shows. Some boy bands have already been formed as well. The App game released in March 2017 has been a smash hit, boasting more than 10 million users! 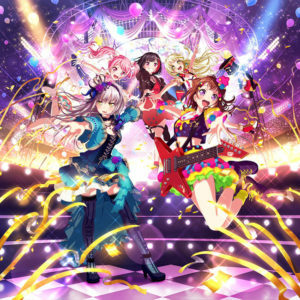 The live show of the [Bang Dream! 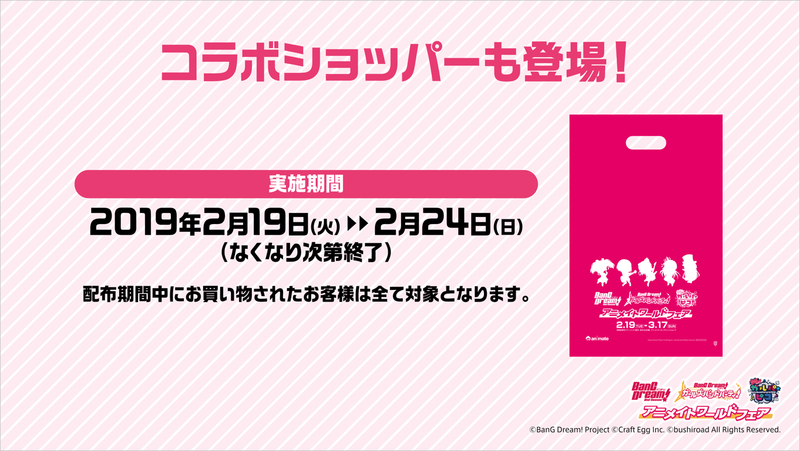 7th☆LIVE]( Poppin’Party‘s appearance will be only 23 days (Sat)) will be held from 21st (Thurs) to 23rd (Sat) of February 2019 at Nippon Budokan. 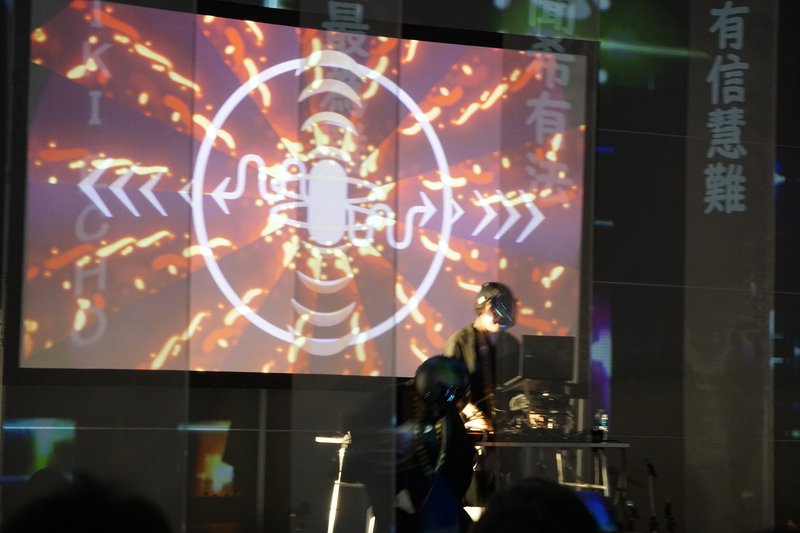 The live stream footage will be broadcast simultaneously overseas in such countries as Hong Kong, Taiwan and Korea. 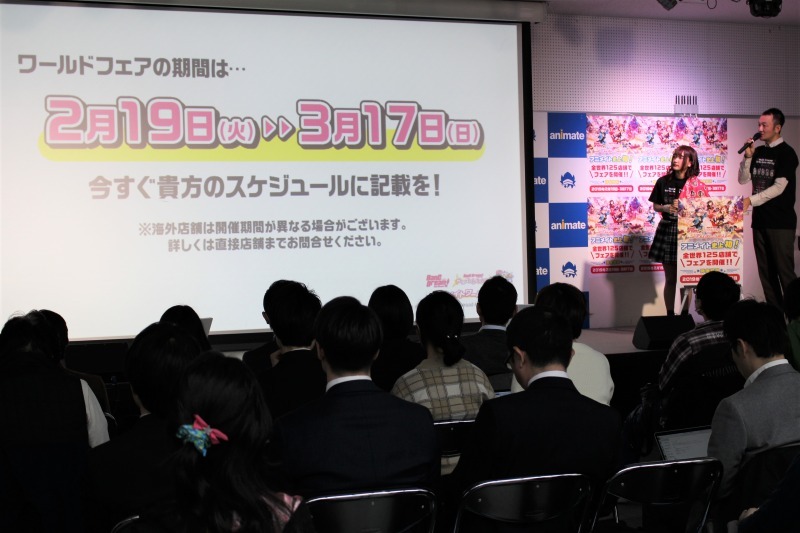 As you can imagine, this timely event will have a huge impact on anime fans all over the world and through this event they can share their happiness with each other across borders. When the announcement of the “BanG Dream! 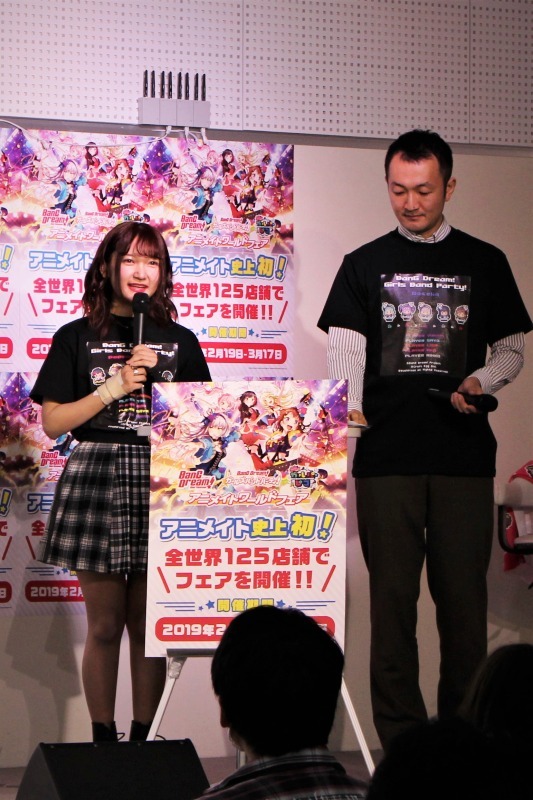 Animate World Fair” was made, Rimi Nishimoto (who played the voice of Rimi Ushigome in Poppin’Party) appeared live on stage and presented the Animate Fair’s original T-shirt; its design will fit everyone and it will be sold during the Fair. 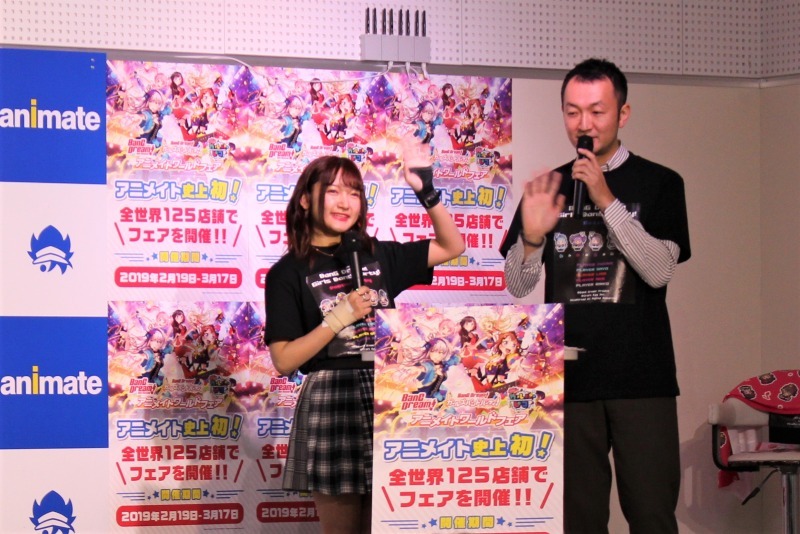 Rimi Nishimoto says, as well as going to Animate shops for work, she also goes when she’s having a day off. 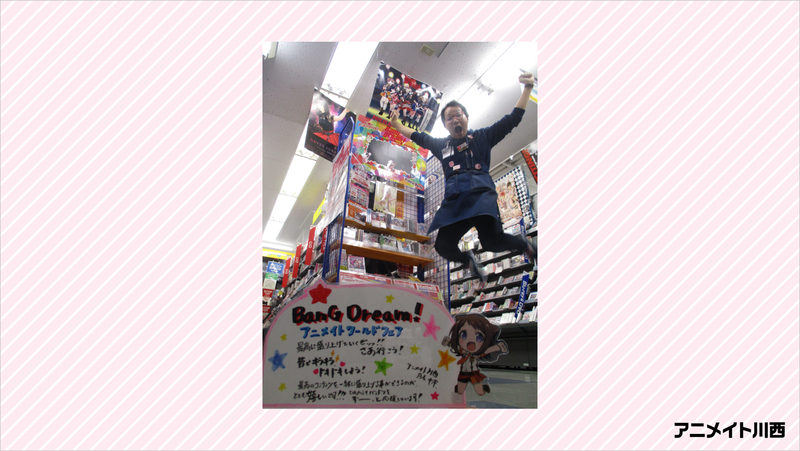 Nishimoto enthusiastically added, “When some limited edition products are available, I go to Animate shops on the first day they are on sale!” She is clearly very excited about the “BanG Dream! Animate world Fair”. 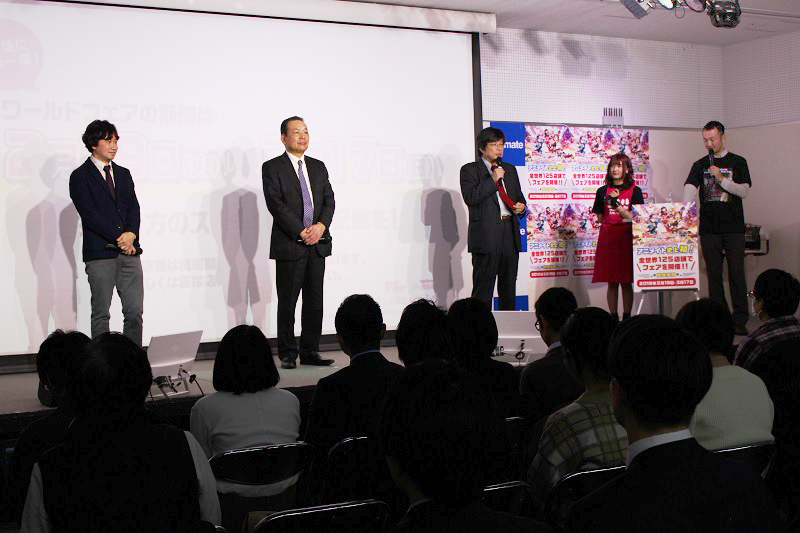 Minoru Sakashita (Managing Director, Animate Ltd.), Akihiro Sotokawa (Director of Overseas Operations Division, Animate Ltd.) and Takaaki Kidani (Representative Director of Bushiroad) appeared on stage to share their enthusiasm about this project. 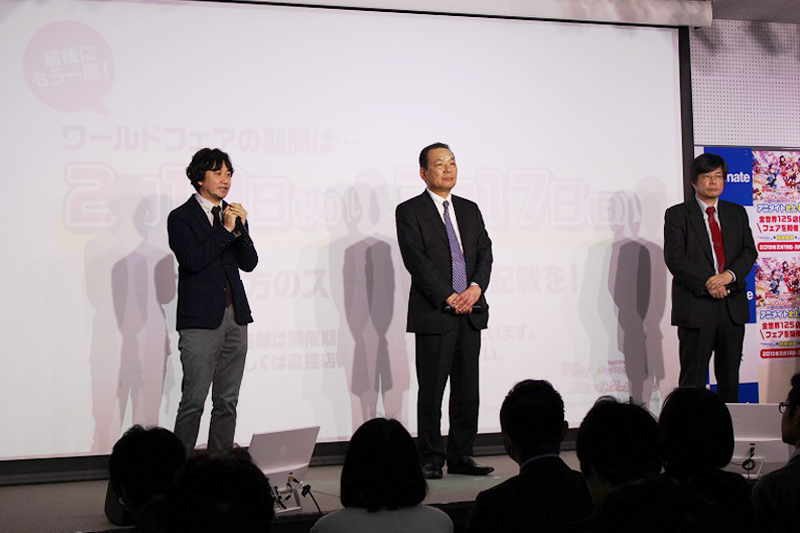 Mr. Sakashita said, “This project will be at an international level and we will definitely make it a huge success. 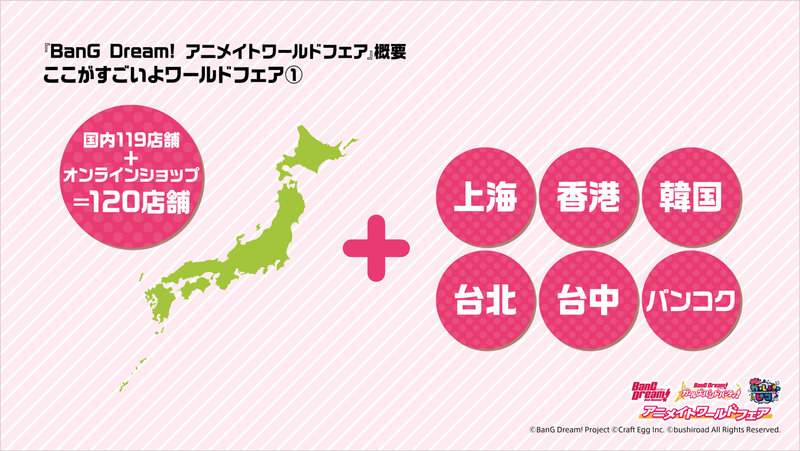 We will feature this project across two pages in Kyarabi (the 5th of February issue). Please check it out!” highlighting the article in their free paper, so all fans should pick up a copy! During the Fair, merchandise of each band will be available with a variety of types and designs. Some products that were previously sold out will be made available again. 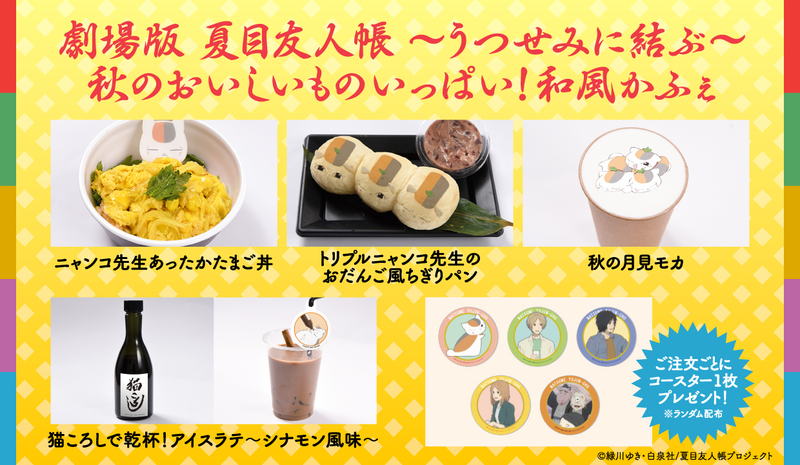 There will be many bonus goods (freebies!) and collaborative products. 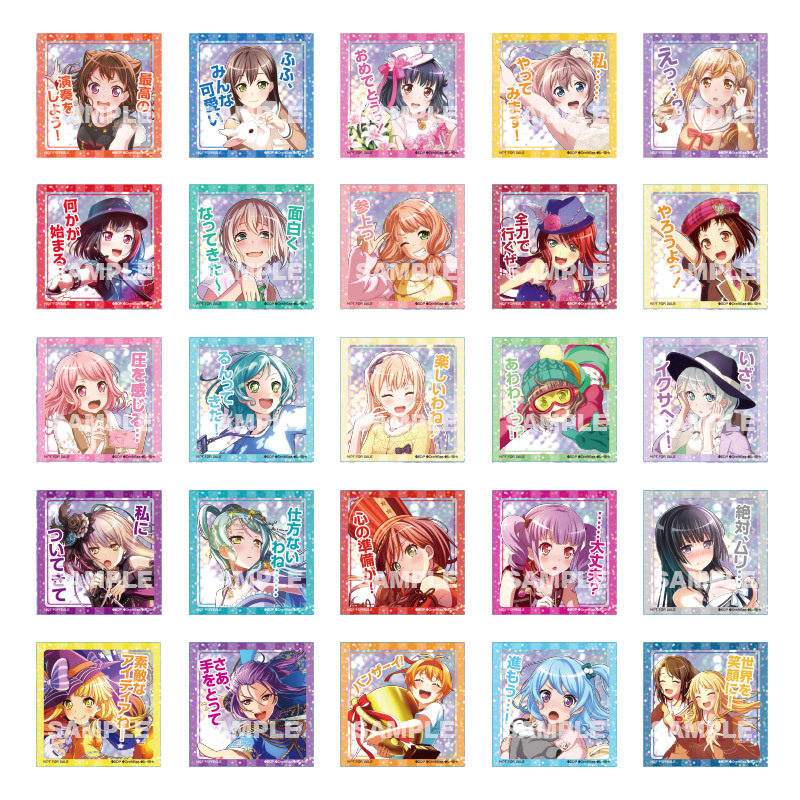 If you want to have the complete collection, you must check out the “BanG Dream!” official website as well as the information page of Animate shops! 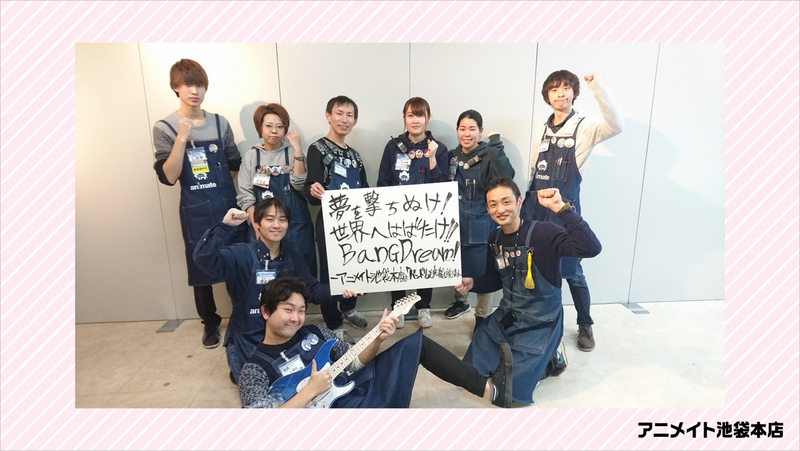 During the fair, the aprons which staff wears at some shops will feature an original design in the themed colors of “BanG Dream!” as collaboration with Animate. 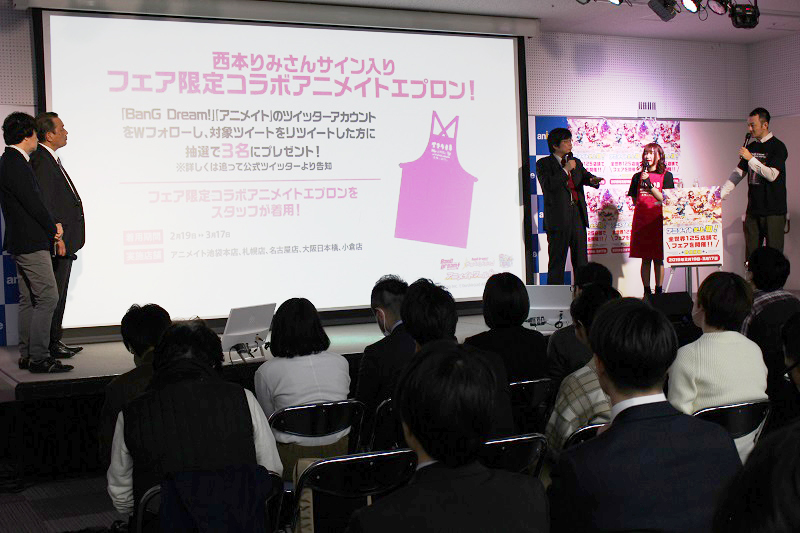 Rimi Nishimoto wore the apron during the press conference, and received many enthusiastic comments such as “Please become a shop owner for a day!” and “Please become an honorary CEO (of animate)!” that made everyone smile at the conference. Before the BanG Dream! Animate World Fair, there will be a double follow & retweet campaign linked with Twitter. Follow both the “BanG Dream!” official account and the Animate official account (@animateinfo). 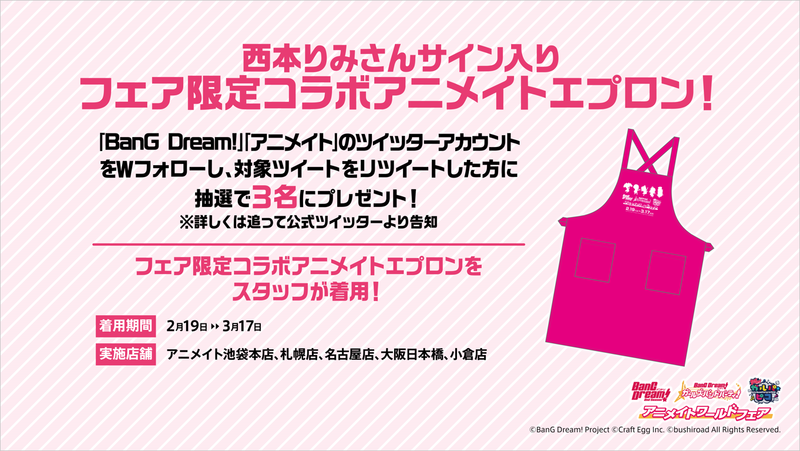 There will be a raffle and three lucky people will get an “Apron signed by Rimi Nishimoto”! The campaign will be held until 23.59pm on 31st of January, so check out both Twitter accounts! Before the BanG Dream! 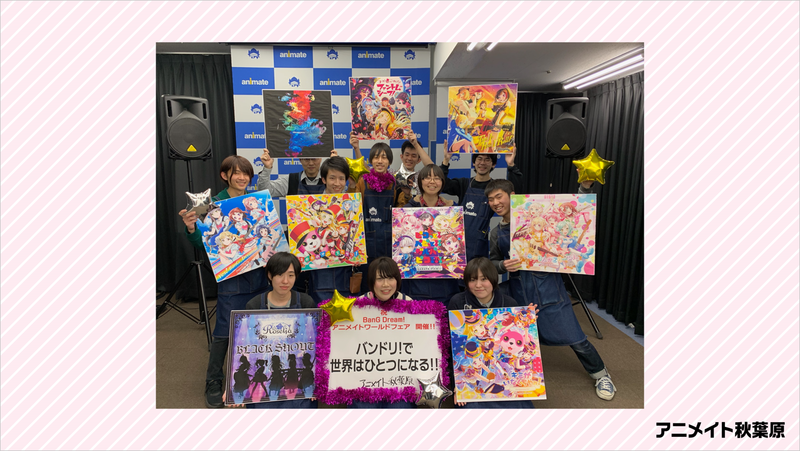 Animate World Fair (starting on 19th of February 2019), there will be the “Animate Only Shop – Road to the World Fair –” starting on 9th of February 2019! During the fair, you can acquire a ticket holder as a freebie. Please check this out if you go to the Budokan live show. 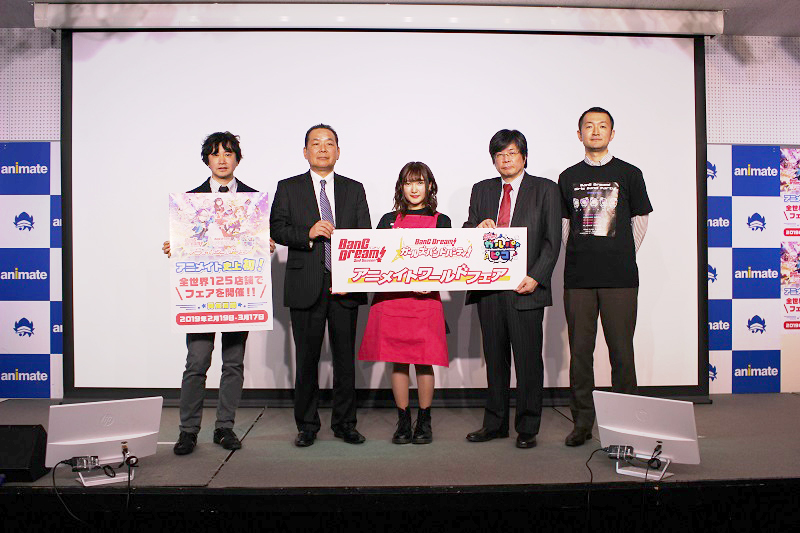 At the end of the press conference, there were supporting messages from Animate staff from Japan and some overseas shops. Rimi Nishimoto was really impressed with the resourcefulness and ingenuity of support from each shop. 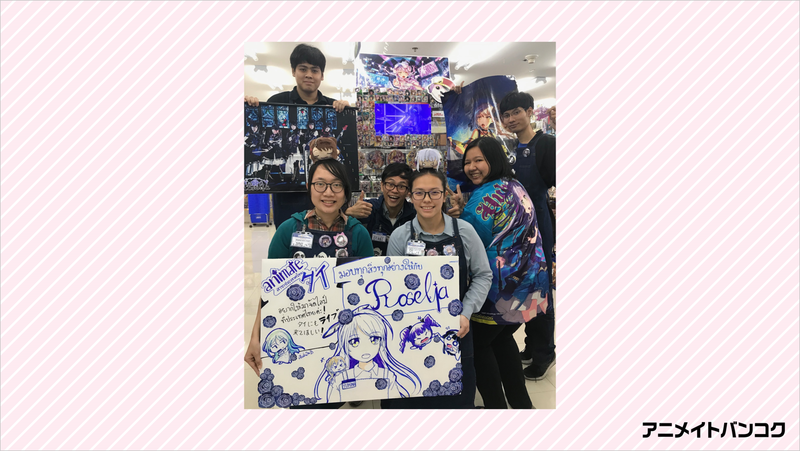 When Mr. Sotokawa saw the shop staff joyfully working on the project, he thought “everyone was much livelier than when they were working!” You could feel the Animate shop staff’s passion for this Fair. 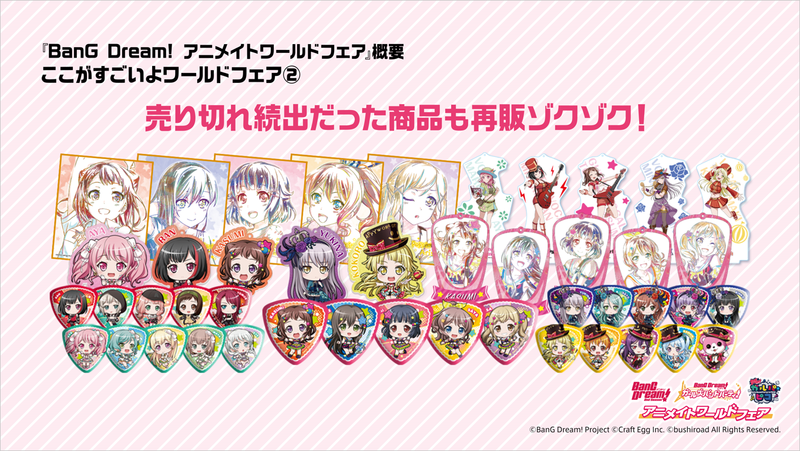 Outline: You can get one of the 25 glittery (kirakira) stickers each time you buy or reserve one CD or DVD or Blu-Ray Disc (more than 1000 yen deposit) related to BanG Dream!, or each time you buy or reserve character merchandise, books (including Monthly Bushiroad magazines). 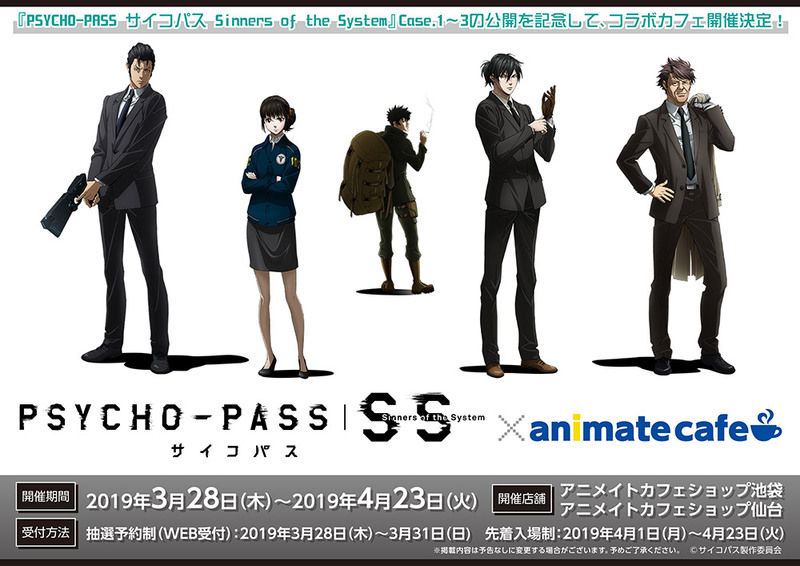 *Please see the Animate official website for more details. *The prices shown include tax. *Fair bonus freebies are distributed randomly, and cannot be chosen. *If there is non-taxable merchandise or raffle item such as tickets or vouchers, those are excluded from the above. *Freebies are only available while stocks last, once gone no more will be available, even during the Fair. *The Fair’s conditions may be changed, delayed or cancelled because of various circumstances. *Please understand that the Fair dates may be different at overseas shops. キラキラステッカー©BanG Dream! Project ©Craft Egg Inc. ©bushiroad All Rights Reserved. 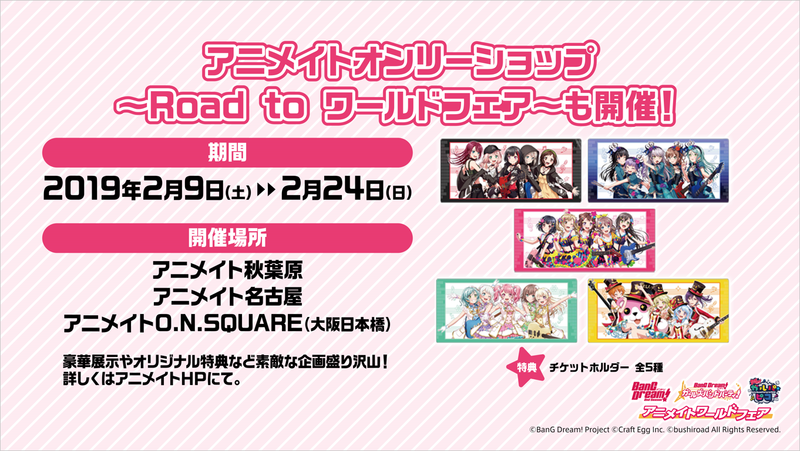 There will be “BanG Dream!” Animate Only Shop – Road to World Fair–! This exclusive “Only Shop” is a path to the Animate World Fair! Many fantastic projects will be going on including fantastic exhibitions and unique freebies! *The freebie of “The BanG Dream! 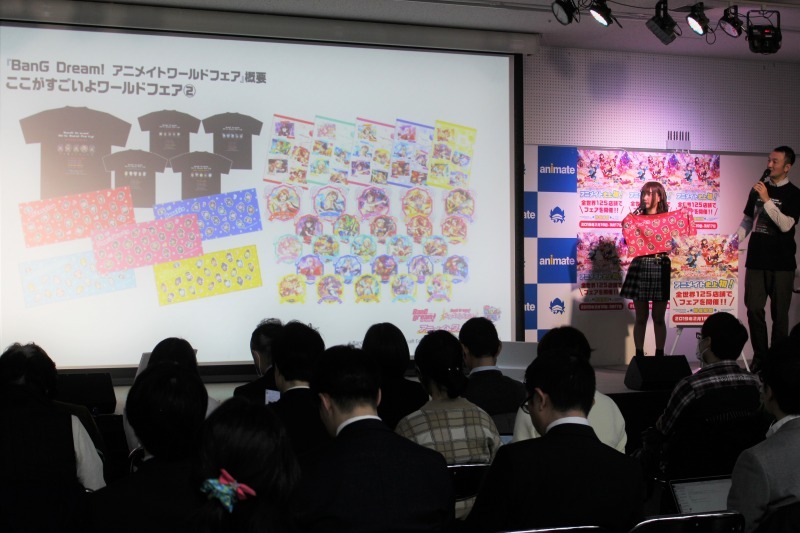 Animate World Fair” will be distributed during 19th to 24th of February. 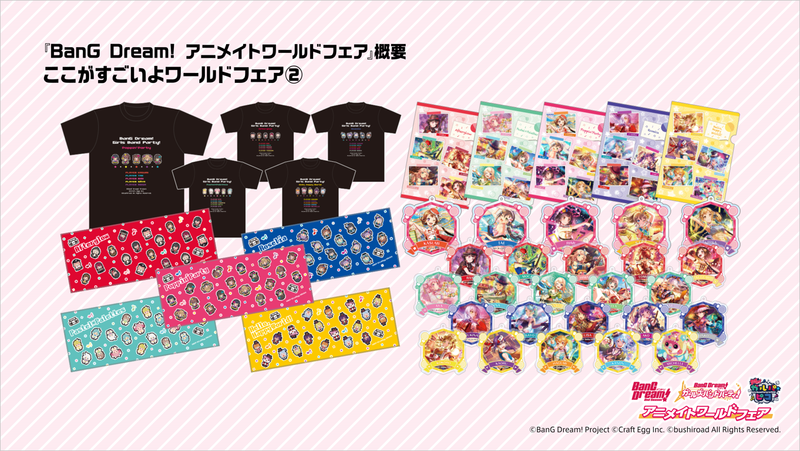 During the project, we will give you one ticket holder (five different kinds) randomly each time you buy or reserve (deposit) 3000 yen worth of “BanG Dream!” related merchandise! *We will finish the freebie campaign once the stock has run out.